The September 11, 2018 episode of WWE SmackDown aired live from the Cajundome in Lafayette, LA. It was the final episode of SmackDown before WWE Hell in a Cell this Sunday night. In addition to the takeaways below, Andrade “Cien” Almas defeated R-Truth in a singles match during tonight’s show. Carmella and Vega argued ringside and Almas capitalized on the distraction by rolling up R-Truth and holding onto his ring attire for leverage. Jeff Hardy battled United States Champion Shinsuke Nakamura to start off this week’s episode of WWE SmackDown. 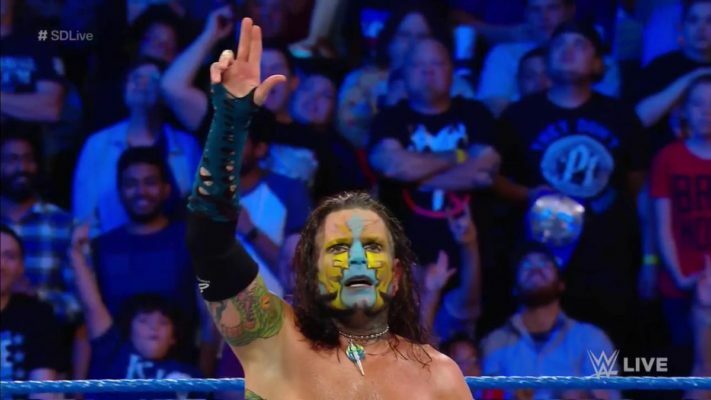 Before the match, Jeff Hardy cut an ominous promo and said that demons are all around us. Hardy stated that he has overcome all of his demons and stands before you a better man. Jeff added that this Sunday he will face his most venomous demon, Randy Orton. Hardy claimed that Orton has no idea what it is like to face somebody that has fought back so many times in his own hell. He said that he has no fear and that he will unleash a lifetime of torment and pain this Sunday on Randy Orton. Jeff then turned his attention to Shinsuke Nakamura and then told everyone to enjoy the show. Hardy started off the match in control and connected with a Crossbody off the steel steps as SmackDown went to a commercial break. When SmackDown returned, Nakamura had Hardy in a Headlock in the center of the ring. Hardy quickly escaped and bounced Nakamura’s face off the top turnbuckle. Shinsuke battled back and knocked Hardy to the canvas. Nakamura followed it up with a series of kicks to Jeff’s chest. Shinsuke connected with a boot to Hardy’s face but Jeff shrugged it off and planted Nakamura with a Slingblade. Nakamura countered a Suplex with a knee of the face. Hardy immediately responded with an elbow to Shinsuke’s face and then hit Whisper in the Wind and both Superstars crashed to the canvas. Jeff made his way up to the top rope but Nakamura greeted him with a knee to the face. Nakamura followed it up with a boot to the face that sent Jeff flying into the barricade outside the ring as SmackDown went to a commercial break. When SmackDown returned, Hardy connected with the Twist of Fate and made his way up to the top rope. Randy Orton emerged from the crowd and shoved Hardy from behind. Jeff crashed to the floor outside the ring and the match ended in a DQ. Orton bashed Hardy’s head into the steel steps several times and then rolled him into the ring. Orton grabbed a steel chair and brought into the ring. Randy bashed Jeff several times with the chair and went for the RKO but Jeff blocked it. Jeff grabbed the chair and hit Orton with it several times. Hardy then planted Orton with the Twist of Fate and followed it up with the Swanton Bomb. Hardy and Orton will compete this Sunday night inside a Hell in a Cell.